Update: the track has gone to #1 in the U.S. and the U.K.
One Direction's success in the U.S. never matched the band's impact in its homeland: while the group has reached the top of the U.K. charts, it never landed a No. 1 hit in America. According to Billboard, Zayn Malik may be close to achieving something his band never could. 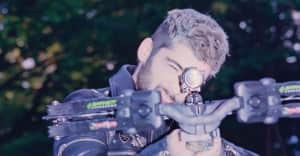 Zayn is predicted to sell around 250,000 downloads of "Pillowtalk," meaning that his single is "almost certain to start in the top five and challenge for No. 1 upon its entrance." Justin Bieber's "Love Yourself" is currently holding the No. 1 spot. Zayn will also have to compete with "Work," the bubbly Rihanna single featuring Drake. Rihanna has 13 No. 1 hits under her belt over the course of her career. Update (2/5 2:31 p.m.): According to Billboard, Zayn will hit number one on the U.K. charts. Reportedly,"["Pillowtalk"'s] combined sales of 112,000 make it the fastest-selling single of the year to date." Update (2/8 2:54 p.m.): According to a press release from a representative for Zayn, the song will hit #1 on Billboard's Hot 100 chart. It's also set to debut at #1 on the U.S. digital songs chart and #1 on Spotify's global chart.